Southern California residents wondering if they need to keep conserving water this summer will get a clear answer from the Metropolitan Water District via a new advertising campaign: absolutely yes. Read the press release and see and hear elements of the campaign. The event at Lake Skinner attracted nearly 700 students from 38 Southland high school teams. 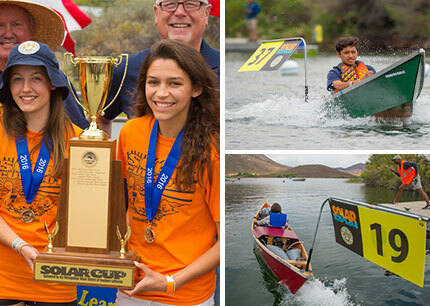 Boats built and raced by students from Riverside Poly High School and Kaiser High School claimed the top awards at the competition, the largest student-based solar-powered boat race in the nation. Lower demands achieved through the region's water-saving efforts and improved water supply conditions, particularly in Northern California, enabled Metropolitan to roll back mandatory water restrictions that were instituted last summer. Conservation as a permanent way of life continues to be emphasized. One of the top fishing destinations in Southern California will be back in business this week with the reopening of the DVL boat ramp on Wednesday, May 18. Boat launches were suspended in April 2015 as water levels receded to record lows, dropping below the lake’s launch ramp. With Metropolitan making its first significant water deliveries into DVL in more than three years, the lake near Hemet in southwest Riverside County will be open to boat launching in time for the Memorial Day weekend. The governor’s executive order makes permanent some urban water conservation rules that had been temporary. He’s also giving local communities more flexibility to decide how much water they should save, depending on local conditions. The executive order says the state must "move beyond temporary emergency drought measures and adopt permanent changes to use water more wisely and prepare for more frequent and persistent periods of limited water supply." Read about the executive order. Read statement from Metropolitan’s general manager. Spending plan earmarks $100 million toward water-saving rebates, programs, sustaining momentum from nation's largest conservation program. General Manager Jeffrey Kightlinger was a recent guest on Conan Nolan's KNBC-TV's News Conference Extra where he discussed the disappointing El Niño in Southern California, the State Project Allocation, missed storage opportunities from the Sacramento-San Joaquin Delta and the California WaterFix. View the program. Also, the general manager recently had an op-ed published in the San Jose Mercury News about Metropolitan’s plans to buy islands in the Delta. Read "Delta Islands Purchase Is to Restore Wetlands, Not Capture Water." The L.A. County Board of Supervisors with External Affairs Group Manager Sue Sims and Water Resource Management Group Manager Deven Upadhyay. L.A. County presented Metropolitan with its 8th Annual Green Leadership award for its precedent-setting turf removal rebates and comprehensive water conservation program. Read the press release. The American Academy of Environmental Engineers & Scientists awarded Metropolitan its 2016 Environmental Communications Grand Prize for its multi-faceted, multi-cultural water-saving communications activities including its "Let's All Take a Turn" advertising and outreach campaign. At left, Assistant General Manager/Chief External Affairs Officer Dee Zinke receives the award. Read the press release. Fact sheets? We got 'em. Metropolitan is on Instagram, Facebook, Twitter (@mwdh2o, @mwdh2o_75years and @bewaterwiseh2o) and YouTube. Follow us on all these platforms for information on all things water and conservation-related.